Stay for a night, a week, or the whole season! Themed weekends every weekend! Like Halloween in June! Evening entertainment like live bands, outdoor movies, DJs, and more! Tons of activities! Bingo nights are a blast for everyone! Family camping is our specialty! Massachusetts camping is the best! Here at Prospect Mountain Campground we pride ourselves on our peaceful family camping atmosphere and affordable prices, whether you come to us in a 40ft Motorhome, ready to pitch a tent, or you're looking to rent one of our rustic log cabins! Kids are free and pets are welcome too, because we know the most important part of camping is having the whole family together! We're a family owned and operated campground, so we know what our campers are looking for in their summer vacation getaway. Nestled at 1,350 feet in the foothills of the Berkshires in Western Massachusetts, we look out over the Pioneer Valley and Connecticut River and our natural setting is sure to delight every camper, with spacious wooded sites, two small lakes, and a mountain landscape. We offer a full activities program including lots of fun and unique events as well as all the classic camping activities like hayrides, arts and crafts, bingo, and family dances. And with themed weekends every week, you can join us for Christmas in July Weekend, Las Vegas Weekend, Pirate Weekend, or many others. Located only 45 minutes from Hartford CT and Springfield MA, the area also offers plenty to do, including Six Flags New England (only 30 minutes away! ), the MGM Springfield, the Basketball Hall of Fame, the "Big E" Eastern States Exposition in September, plenty of hiking trails and other outdoor activities, as well as a number of fascinating museums! Whether you choose to visit us in our rustic rec hall to eat lunch from our snack bar, enjoy an evening performance by a live band in the pavilion, go fishing or paddleboating with the kids in one of our ponds, take a break from the sun in our heated pool, laugh at the wacky events and activities the kids will love (and maybe let loose your own inner child and join in), try your hand at competition with a round of minigolf or laser tag, or just sit around your campfire and relax among the peace and quiet, Prospect Mountain Campground has something to please the whole family . . . and that's exactly what we aim for. So what are you waiting for? Contact us today to start planning your camping trip! The 2019 season is just around the corner! We've been busy planning and have updated our rates and events for 2019! 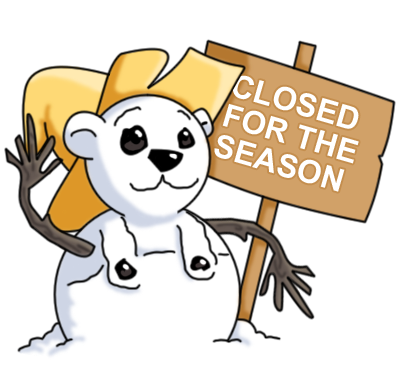 Though we are closed for the winter, emails and phone calls will still be returned throughout this time, so whenever you're ready to plan your summer vacation, just let us know and we'll be here to help! We know you can't wait to camp again, but while we are closed please do not come to the park without a confirmed appointment first. Thank you! See you in May! Making reservations at Prospect Mountain Campground is considered agreement to abide by all rules and regulations including our cancellation policy.